This year we are lucky enough to celebrate Halloween with a bunch of amazing Harlequin authors! Specifically, Author Julie Kagawa, and her character Zeke are stopping by the blog! This sweet, tough, and disillusioned boy came over to tell us what's the 'Scariest part of being in love'. "The scariest part of being in love? You mean...other then the fact that the girl I'm in love with happens to be a vampire?" *Laughs* "Well, to be honest, I guess what scares me the most is Allie's belief that she's a monster. Not that I believe she is; I've watched her fight. I've seen her struggle so hard not to give in to her instincts. And she does have that darkness inside her, that drive to kill and feed and destroy like all the other vampires; I'm not so blind to think it isn't there. But I've accepted that part of her, and I know she will continue to fight it with everything she has. It doesn't scare me. She doesn't scare me. "No, what scares me is that Allie sometimes believes she's nothing but a vicious, soulless killer. And, because she doesn't want to hurt anyone, she'll pull back, shut everyone out. The thing that frightens me most is the thought that, one day, Allie will decide she can't put me in danger anymore, and she'll leave. Walk out of my life forever. But it's all right. Because if that happens, I'll just go after her again. She can push me away all she likes. I won't give up until I convince her that she's not a monster, and that I don't care if she's a vampire and has to feed on humans and only comes out at night. None of that matters to me. When I look at Allison, I don't see a monster, or even another vampire. I fell in love with the girl." Allison Sekemoto survives in the Fringe, the outermost circle of a walled-in city. By day, she and her crew scavenge for food. By night, any one of them could be eaten. Some days, all that drives Allie is her hatred of them—the vampires who keep humans as blood cattle. Until the night Allie herself dies and becomes one of the monsters. Harlequin is hosting two amazing giveaways for the tour and Tynga's Reviews' readers gets to participate in the Trick giveaway! Open to Canada & US only. All you have to do to enter is to fill the rafflecopter form below! I haven't heard of this book yet, but I love me a good vampire story! Also, I don't think I've ever come across one where the girl was the vampire and the guy a human, so that'll be a nice change of pace from the norm. I love paranormal books... not so much a scary book fan. I get scared by Stephen King's books! I love Julie's book and the Iron Fey series. I can't wait to read The Immoral Rules. Paranormal books are the best. I need to read The Immortal Rules and I can't wait for her next book about dragons! I love The Immortal Rules and The Eternity Cure. One of my favorite series! I don't read many scary books but I definitely love paranormal. I really wanna to read Alice in Zombieland by Gena Showalter. It's gotten so many good reviews much like Julie's series. There alot of goods books in that box !!! Rachel Vincent Soul screamer serie is amazin !!!! I loooooove paranormal reads! And since paranormal YA is sooo hot now I am in heaven! Wish I had these books when I was a teen! I love everything and anything by Julie Kagawa. Can't wait for the third book in the Trilogy! I usually like scary books during this time of year - autumn. Provides an adrenaline rush during the cold times. Wonderful giveaway! I totally love paranormal books! I can't put them down! I'm reading hourglass by Myra McEntire right now and love it! I love the Immortal Rules series! 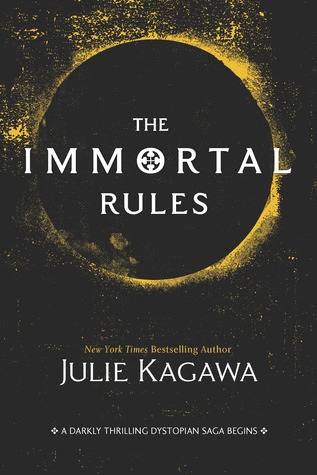 I LOVED The Immortal Rules <3 I seriously need to get into The Eternity Cure soon because Julie is an amazingly talented author!! Love this interview with Zeke! !